Atari promised gamers an amazing experience. Unfortunately, this game falls short on almost every level. Alone in the Dark was one of those games I expected to earn decent reviews when I saw the first screenshots. The fact that the Wii version was developed separately from the HD versions also helped to keep my hopes up. Unfortunately, Alone in the Dark’s innovative ideas suffer from branching out in too many different directions with too little focus on actual polish and fine-tuning. 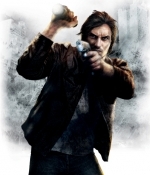 When you start the game, you’ll find your character confused by an acute kind of amnesia: Edward Carnby, whom you may remember as the protagonist of the very first Alone in the Dark game, can’t remember anything. To make matters worse his vision is blurred as well and you have to press a button to make him blink. Yes, that’s true: Press a button to make your character blink during the cut scene. And while the blinking surely doesn’t feel out of place, the inclusion of such gameplay tweaks is typical for Alone in the Dark--the game sometimes feels a bit like a compilation of mini games rather than the epic survival horror adventure it claims to be. To be honest, this is the reason why Alone in the Dark falls short on so many levels. Be it the blinking during cutscenes, driving a car via gestures or using an extinguisher to extinguish flames, it all feels somewhat tacked on, gimmicky and sometimes even out of place. Apparently the developers put so much effort into using as many different ideas in the final game as possible, they forgot about one of the most important things in game development: polish. To make matters worse, the game isn’t scary, either. Neither running through a burning house nor fighting zombies in a dark room is going to frighten you, and the fact that one of your main “enemy” types in the game are living cracks (yes, cracks) that are going to chase you through New York, doesn’t really improve the atmosphere. 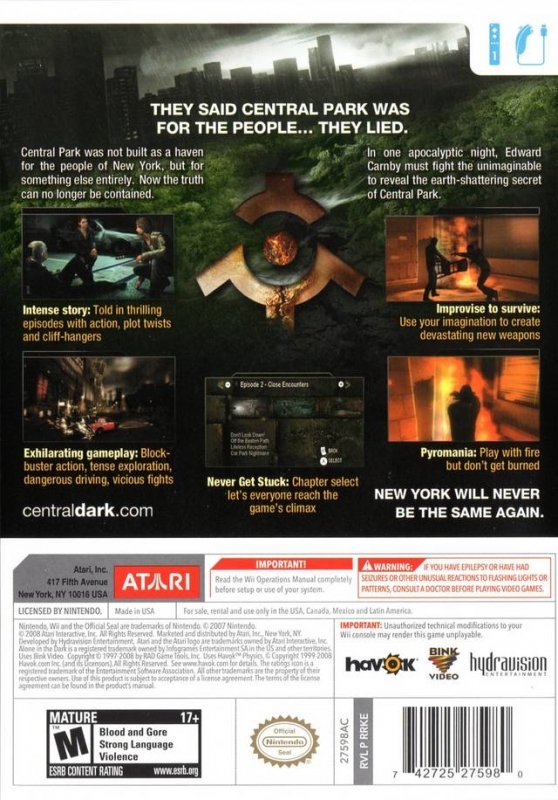 The story could have been decent, but the whole “conspiracy!” topic would be so much cooler if it didn’t think of itself as one of the most amazing stories ever seen in videogames. The story is nice (at some points I even wanted to know how things would turn out) but the fact that it is presented in such an “epic” way makes it feel ridiculous at times. Another interesting idea Atari implemented is the lack of a traditional health bar. Instead of telling you how much damage Carnby has taken, the game lets you – literally – walk in the dark. You’ll notice that your death is near as the screen gets blurred and the colours on screen vanish, but it’s often too late to react then and you’ll often face instant death without knowing that you had actually lost a lot of health already. 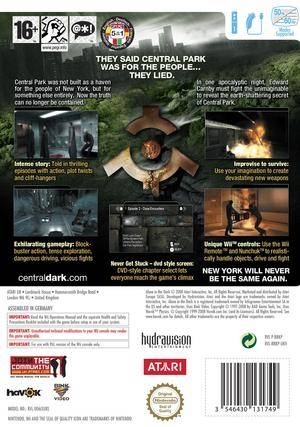 What really killed the game for me was that Alone in the Dark lacks something you should expect to get from every game, no matter how bad it is: Sense. The gameplay bounces from survival horror, to mini games compilation, to racing game, to first person shooter (hell yes!) and back to survival horror. There are even passages that play like an on-rail shooter. But what was well implemented in Nintendo’s Disaster: Day of Crisis feels completely out of place at some points in this game. Don’t get me wrong: Alone in the Dark has its moments. Some of the puzzles in the game are well implemented, and while the game isn’t scary, it does a decent job as an adventure game at least. The fact that you can choose each chapter in the game, DVD-style, right from the beginning is also nice, though the small flashbacks implemented to help you understand the story better are sometimes confusing. Without skipping chapters the game will last around 5-6 hours. 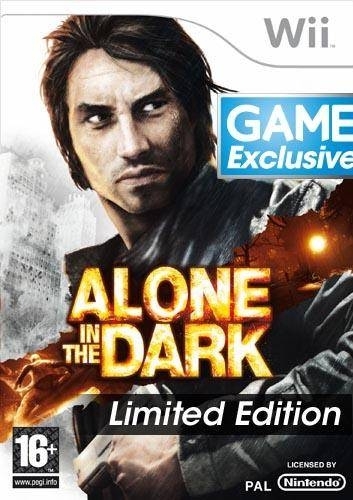 All in all Alone in Dark needed another 6 months of development time. The graphics aren’t going to astonish you either. You’ll notice a lot of blurry textures, the character models look ok at best and the animations (especially the faces) are below average. At least some of the effects in the game are well implemented. What really killed the fun for me was the camera, though: In Alone in the Dark, you can interact with certain objects, which are highlighted by a sign. Unfortunately you sometimes won’t be able to see that sign and thus be unable to distinguish between useful objects and background inventory. Taking care that important signs are visible on screen would’ve been a nice idea to begin with. The cut scenes are nice but sometimes the camera feels a bit awkwardly placed and the quality isn’t too amazing. The fact that you can interact (to a limited extend) with the game in some cut scenes is nice but overall the graphics are average at best. Especially lack of graphical contrast in the game is sometimes confusing and makes lots of sceneries look somewhat blurred and unreal. Where the game finally starts to shine is the sound. While the German voice actors sound terrible the English ones do a rather good job. 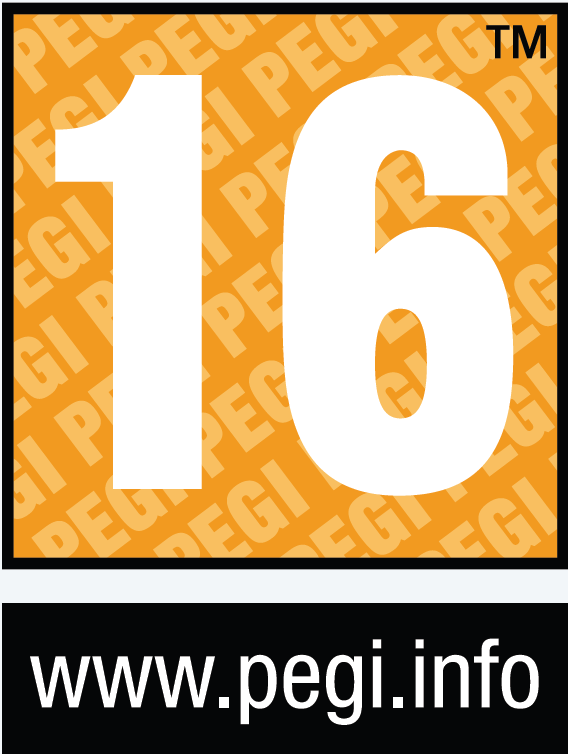 It is nothing amazing but decent work for a game that (probably) didn’t have a big budget. The tracks are nice and most likely the best part of the game: The music really helps to create some kind of atmosphere (the rest of the presentation fails to create any atmosphere at all at times) and its quality is decent. The only flaw I discovered is that it sometimes starts playing when you wouldn’t expect it. 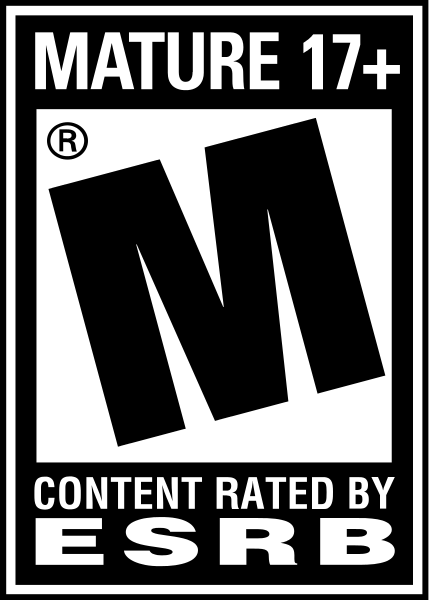 But hey, let’s give this game credit where credit is due, even if it’s just the music. But before we get to the final verdict what I'd like to point out is one thing: This game confused me. Hardly ever has a game left me so confused after playing it as it lacks the consistency that makes so many games great. I can't give you a reason to buy Alone in the Dark. You may like half of the missions in it or you may dislike every single one. The game features so many different things and ideas there is no such thing I could say like "if you like ... buy this game" because it doesn't focus on one kind of gameplay. I can only tell you that what was implemented in the game doesn't feel well thought out and is not polished enough to recommend the game to anyone. One thing that really nails this impression was my girlfriends comment after I stopped playing the game. "You look like you have a question mark above your head". That really nails it. Keep that in mind before reading the last paragraph--there is a chance this game will make you want to call on a doctor. 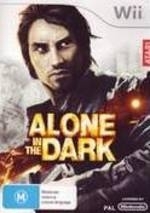 But to get to my own opinion now: In the end Alone in the Dark was definitely a disappointment to me. Sure, there are moments where the game shines and the sheer fact the developers wanted to go the extra mile to include many great ideas in the game is admirable. But most of those elements feel tacked on and I could never get rid of the feeling that this game would’ve been much better as an adventure instead of a survival horror experience as the game’s structure itself would rather fit that genre. This way Alone in the Dark sits on the fence between survival horror, adventure and a compilation of different genres and feels like it urgently needed an additional six months of development time. This game is so bad Atari should go bankrupt. How did it manage tell 100k+?? Bah - where did the "I own this" button go. I have bern away for along time. Could just be the WII version of Opera. This game is very ... meh. I am rarely scared, in suspense, or feeling tension. I mostly run the gauntlet of near-sighted zombies. it's not bad but not as good as expected, also, how comes so bad sales? ?